Save Our Shekels! : What's the best use for vouchers (tavim)? What's the best use for vouchers (tavim)? If you're like most salaried employees (known in Hebrew as schirim), or if you've taken my advice and signed up for one or more online survey sites, you're probably in possession of a number of gift vouchers, known locally as tavei shai, tavei kniya or just plain tavim. These vouchers are usually issued by one of the large supermarket conglomerates - Shufersal, which owns Shufersal, Shufersal Deal, Shufersal Sheli and Yesh, produces Tav HaZahav, and The Ribua Kachol (Blue Square), which owns Mega, Mega Ba'Ir, You and Zol B'Shefa, issues Rav Tav. 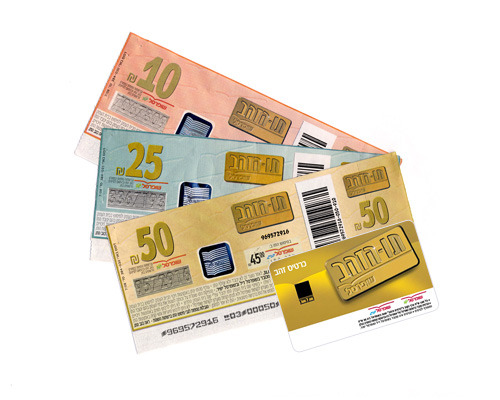 Other than the supermarkets owned by the company issuing them, these vouchers can be used in a variety of chain stores you often find in malls. Companies who give these vouchers as a holiday gift (Shai LaChag) to their employees before Rosh HaShanah and Pesach each year typically buy them at a discount, which makes it an attractive proposition for them. The limits upon their use - many stores don't allow purchases with vouchers of items on sale, or their use annuls any other discounts on the items - make them a somewhat less attractive proposition for you, at least as compared to a plain cash gift. However, let's not look a gift horse in the mouth and see how we can make the most of these vouchers. Conventional wisdom holds that the best use of your vouchers is for their original purpose: your large pre-holiday food purchase at one of the supermarkets belonging to the conglomerate issuing the voucher. A new law passed last year, which determines that tavim issued from July 1st, 2014 and onwards must be honored at 100% their face value (instead of 90-95% in supermarkets, as before)*, seems to strengthen this position. Make sure, however, that you shop in the cheapest supermarket the voucher is allowed at - for example, Zol B'Shefa rather than Mega Ba'Ir - so you can get the most bang for your shekel. However, this may not always be best for you and your family. While it's true that everyone needs to buy food, you may find that the supermarket of your choice isn't on the voucher, or you may prefer to use the vouchers to buy holiday gifts or clothing. Well, now's the opportunity to take advantage of being an Israeli in Israel, more specfically to start thinking and acting like one :) . I know that you remember that back in the old country, rules were rules, and if the voucher said it was good only for certain types of purchase in a given store, then that was that and there was nothing you could do about it. In practice, though, here in Israel the rules may be different between different branches of the same store, outlet vs. regular branches, or the rules may simply be ignored. It's always worth asking when you enter a store, "Ha'im atem mekablim tavim?" (Do you accept vouchers? ), and if the person behind the counter says "Yes, but...", and states the limitations on the vouchers**, you know you may not get the most out of your vouchers here. However, if they simply say "Yes, we do", it's quite possible the rules will be waived. Another approach is to simply offer the vouchers as payment at the counter without a word; if the cashier objects and you feel you're not getting your money's worth, you're entirely within your rights to return the merchandise to the shelf and walk out without buying anything. Another issue with vouchers is that instead of change in cash, you will often receive a voucher (zikui) in return, which can be used in any branch of that particular store, and is subject to the same limitations the original voucher is. If you're a regular shopper at that store, that shouldn't be an issue, but even if you're quite certain you won't be there in a long while, you still have options. One solution to this is to make sure you don't get any change by paying most of the total in vouchers and the rest in cash. For example, if the item costs NIS 110, pay NIS 100 in vouchers and NIS 10 in cash. Another way is to accept the zikui and attempt to sell it online for most of its value - either on your local email list, or via the mobile application Zeek. The good news is that Shufersal, at least, has taken notice of these limitations and has come up with new gift cards which are not subject to any limitations at any stores which accept them: Tav HaZahav Cash. If you get those from your employer or a survey site (as I did recently), use those for your non-food purchases. However you decide to use your vouchers, happy shopping to you! * If you have tavim in your possession that predate July 1st, 2014, you can replace them until May 30th, 2015 at a branch of the supermarket which issued them with a magnetic card of equivalent value that will be good for at least the following 54 months. You hand in the vouchers, supply your full name and address and the card will be sent you within 14 days by mail. **Keep in mind that it's illegal to state limitations not explicitly listed on the voucher.